4 x 3 x 4 in. 22 x 26 x 14 in. 24 x 26 x 14 in. 12 x 6 x 4 in. 12 x 9 x 4 in. 12 x 20 x 4 in. 14 x 7 x 3 in. 9 x 18 x 3 in. 19 x 9 x 3 in. 12 x 6 x 6 in. 14 x 14 x 4 in. 10 x 5 x 5 in. 12 x 10 x 2 in. 12 x 10 x 5 in. 10 x 5 x 6 in. 12 x 18 x 4 in. 12 x 5 x 3 in. 7 x 8 x 7 in. 12 x 43 x 5 in. I grew up near the North Shore mountains in Vancouver, British Columbia. In those days dogs, cats children and the odd white duck roamed the streets, parks, and beaches unleashed and unchaperoned. People and animals were personalities of equal importance in our world. I draw on these memories of my fellow travellers and on constant observation when I try to portray the soul or character of my subjects in papier mache. I am intrigued by the mysterious relationship we have with animals. The mystery being that while they are our closest kin in this universe, we seldom can really say we know what they are thinking and feeling. With wild animal sculpture especially I love this mystery and try to express its beauty and danger. Sadly, dangerous mostly to the animals. Is our relationship with other humans always that much closer? 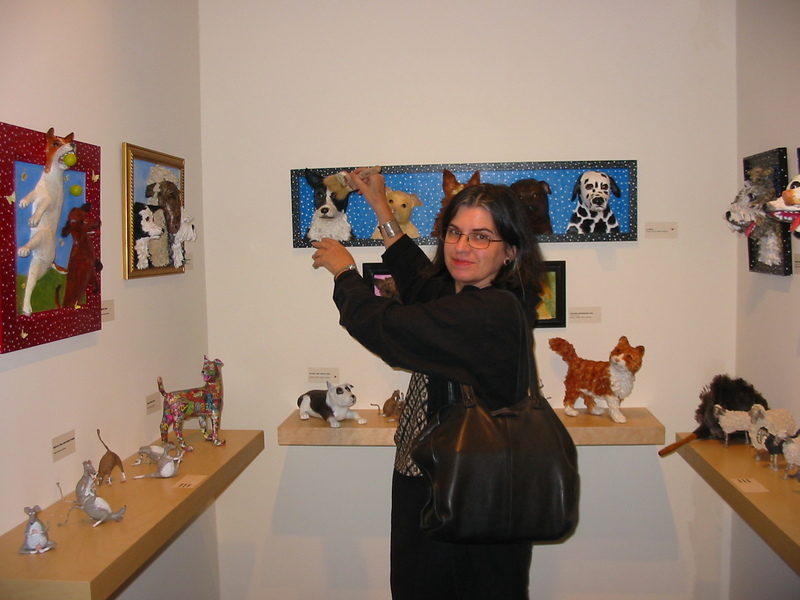 I studied fine arts at Concordia, U.B.C., and Emily Carr College of Art and have been working in papier mache since 1990. My sculptures begin with an armature of wire. Newspaper is my basic material for building the form with other papers sometimes added to the surface. Most pieces are finished with acrylic paints and varnish. I take commissions for any subject, specializing in animals and portraits of pets. If you like something on this page which is sold please contact me about commissioning a similar one of a kind piece. CCBC Shop & Gallery and Circle Craft on Granville Island have work of mine for sale. Crafthouse in the Domestic Terminal at Vancouver International Airport.